– Monkey-man by Usha K.R. The list includes 1994 Nobel Laureate Kenzaburo Oe and represents fiction writers from countries as disparate as India, China, the Philippines and Japan. This year’s judges are Monica Ali, Homi K. Bhabha and Hsu-Ming Teo. Finalists will be announced in February and the winner will be named in March at a ceremony in Hong Kong. The Man Asian Literary Prize was founded in 2007. Awarded annually to an Asian writer, the Man Asian Literary Prize is given for the best novel either written in or translated into English. 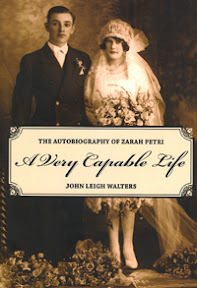 This week, Kitchener, Ontario author John Leigh Walters was awarded the 2010 Edna Staebler Award for creative non-fiction for his first book A Very Capable Life: The Autobiography of Zarah Petri. Walters’ A Very Capable Life is the story of his mother, Zarah Petri, and her life as an immigrant during the twentieth century. Walters is being heralded for mastering the first-person autobiography of another person. He writes Petri’s stories in her voice, from her point of view, and creatively reinterprets landmark twentieth century events through her perception. Now retired, Walters hosted and produced television shows in Canada and the United States for most of his life. Most recently, he hosted a program on CTV in Waterloo. The Edna Staebler Award, established by Staebler in 1991, annually acknowledges the best first or second non-fiction work of an author that significantly portrays Canadian culture or takes place in a Canadian locale. The winner receives $10,000 from Wilfrid Laurier University in Waterloo, Ontario. Wilfrid Laurier University recently published a collection of Staebler’s diary entries entitled Must Write. Edna Staebler was one of Canada’s most well-known writers, regarded widely for her Mennonite cookbook series Food That Really Shmecks. She also wrote for popular Canadian magazines Maclean’s, Chatelaine, Reader’s Digest and Star Weekly. In 1996 she was awarded the Order of Canada. The longlist for the 2010 Man Booker Prize for Fiction was announced July 27, narrowing down an initial 138 nominations to thirteen runners. Being this‘s CanLit correspondent, I am pleased to report that two Canadian authors have made it through to this year’s Booker Baker’s Dozen. The Northern hopefuls are Emma Donoghue for her novel Room, and Lisa Moore for February. Emma Donoghue is an Irish-born writer who settled in London, Ontario in 1998. Writing professionally since the age of twenty-three, Donoghue writes fiction, drama, young adult, historical and literary fiction, and short stories. Hitting the literary scene in the early nineties, her first novels focused on contemporary life in Dublin. Most recently she has published a historical fiction trilogy made up of Slammerkin (2000), Life Mask (2004), and The Sealed Letter (2008), which investigate the British class system from the fourteenth century until the eighteenth century. Room (September 2010) is the tale of young boy Jack and mother, Ma, who reside in a room. Jack has never seen the outside world, until he escapes amidst dire circumstances. Donoghue has won several literary awards, including the 2009 Lambda Award for best Lesbian Fiction for The Sealed Letter (also longlisted for the 2008 Giller Prize), and the 2002 Ferro-Grumley Award for Lesbian Fiction for Slammerkin. Lisa Moore is a St. John’s native and studied at the Nova Scotia College of Art and Design. She has released two short story collections, Degrees of Nakedness (1995) and Open (2002) which was nominated for the Giller Prize. Her first novel Alligator (2005) won the 2006 Commonwealth Writer’s Prize Best Book Award for the Caribbean and Canada region. Her 2010 Booker longlisted novel February tells the story of one Helen O’Mara who is haunted by the loss of her husband Cal who died in an oil rig accident in 1982. The 2010 shortlist of six authors will be announced September 7, 2010 and the 2010 Man Booker Prize for Fiction winner will be announced October 12, 2010.